This is my bathroom as of September 2013, enjoy! This is the exterior and entryway of my house as of September 2013, enjoy! Yeah, it was a mess. But, it was all worth it because it got done and it looks beautiful! So pretty right? 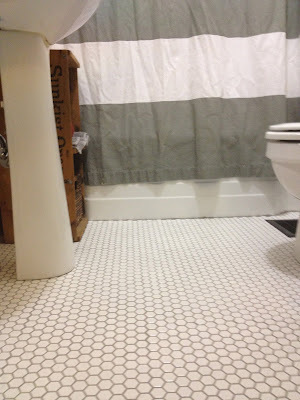 I chose white hex tiles from Home Depot. I vacillated between the all white and the black and white for a long time, but finally decided that the white may be better for reselling the house. I also decided to add some more art and storage to the walls. This is an old orange crate that my grandma gave me. 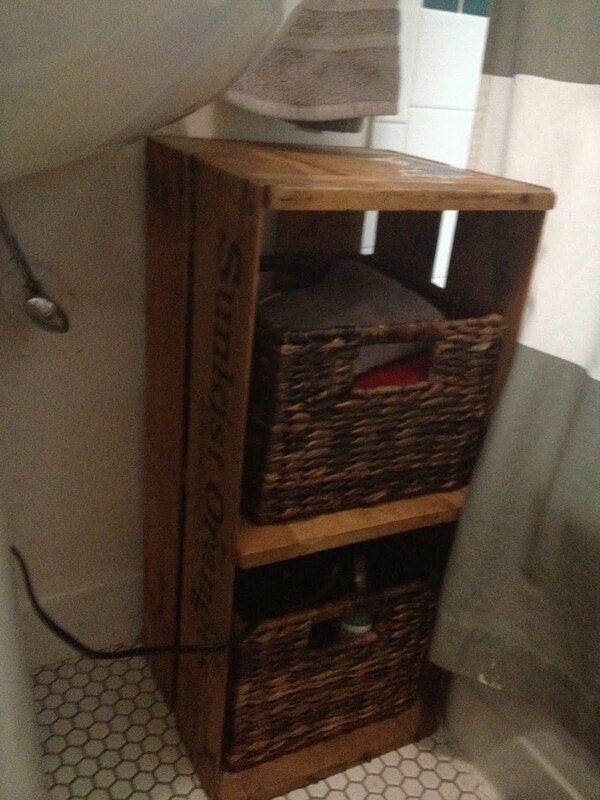 I set it on it’s side and added baskets for storage. I went to a local salvage yard and found some more crates and decided to hang them on the wall. I also decided to group together all the pencil drawings I’ve collected which is a total of… three. My collection is a little young but it’ll get better. Here is the final collection which is above the toilet opposite of the medicine cabinet. I’m very happy with the way it all turned out! It’s actually not that bad. The toilet and pedestal sink are a classic style and they are white so I can work with those. The shower tile is okay. 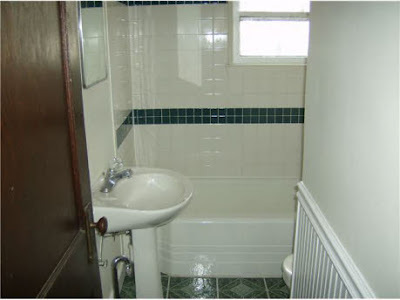 I like that the majority is white, but that green border annoys me and it all needs re-grouted. The medicine cabinet was disgusting. It was too small in the space and it was so rusty I could barely open it. 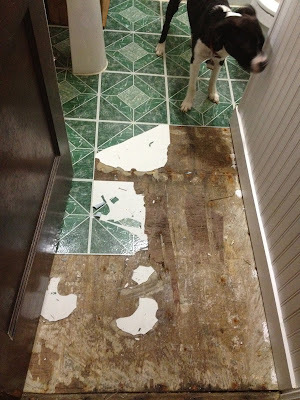 The flooring was also pretty gross. Hunter green faux marble tiles, they were basically laminate stick on tiles… ugly. 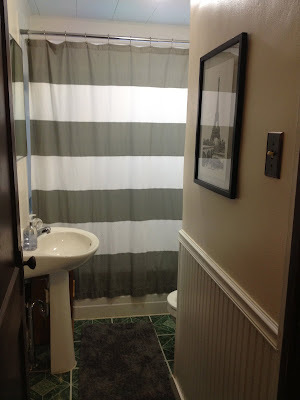 My game plan was this: add shower curtain, change out medicine cabinet, paint, and tile floors. A modest over haul. 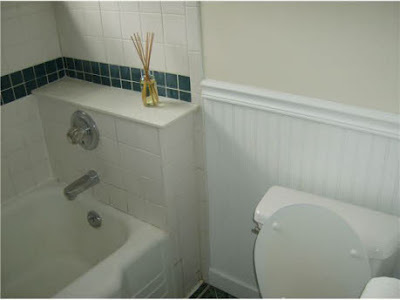 But since I couldn’t start the remodel right away I added a few things to make it passable for a nice bathroom. I bought an awesome shower curtain from West Elm, I love the bold stripe. I also added a pencil drawing from Paris and my mini make over was done until I got the mirror installed. While I was waiting for my handyman to make time for me (another story all together) I decided to paint. I made a rash decision at Ace Hardware one day and bought a light yellow color. I really, really wanted to like this color for many reason. One, I just bought a whole gallon of it and two, I am super lazy and didn’t want to paint again, and three, it wasn’t that bad… right? WRONG. It was way too bright and just too much so I painted it for a third time. You should know by now I am super ashamed of how rashly I acted so many times in a row, but alas that is my personality. I decided to go back to what is was originally… a soft cream. I actually had a gallon on hand from another project so thankfully I didn’t have to buy a third gallon. For now it looks good. 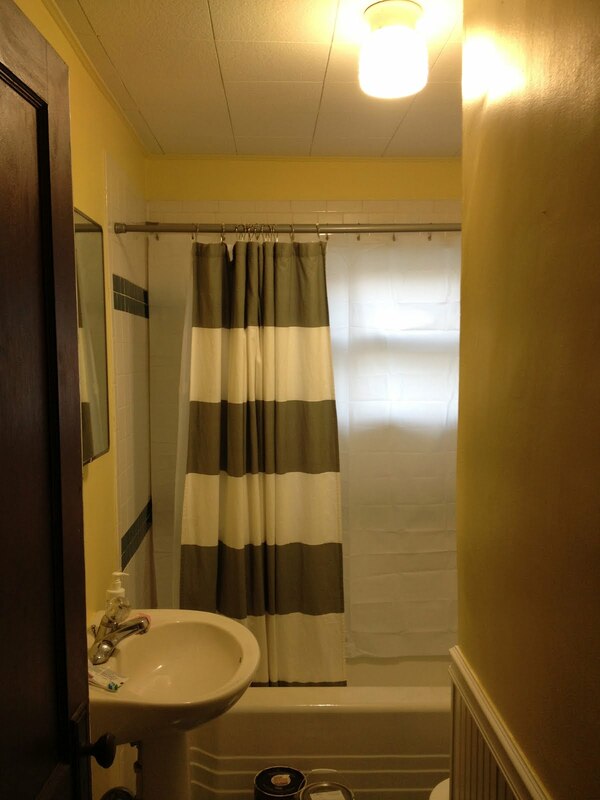 It is a soft color that is slightly warmer than the stark white trim. Perhaps some day I’ll try again but for now I’m happy with it. 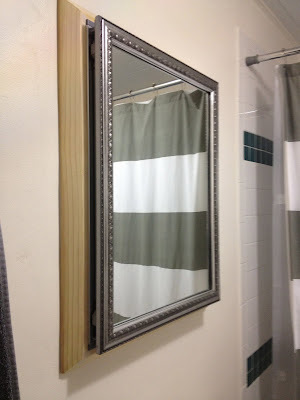 My next project was the mirror. 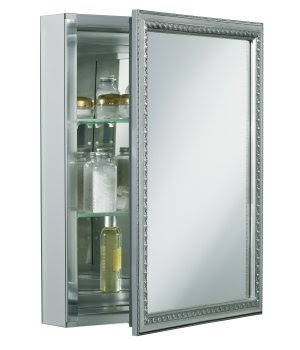 I am a Craigslist junkie so when I came across this Kohler medicine cabinet new in the box for $115 I knew it was for me. I negotiated it down to $100 and then hired a friend to help me put it in. Unfortunately, I didn’t properly measure before buying (a common problem for me) so my friend had a lot more work to do before it could be installed. 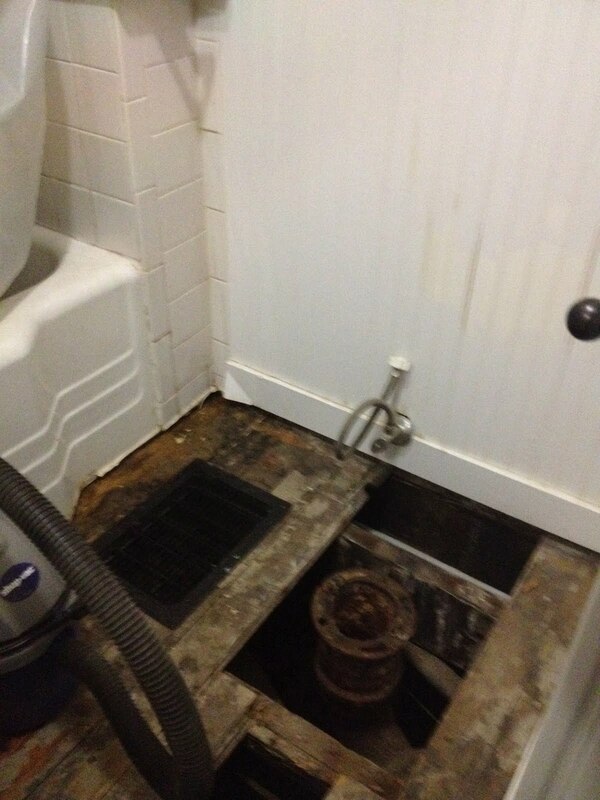 After pulling out the old medicine cabinet he had to make some major cuts to make it fit. 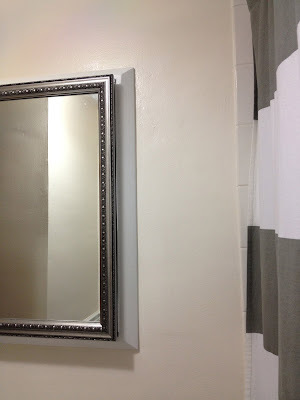 Because of the sizing problem he had to improvise by building a frame around the mirror. Here it is before I painted it. And here it is after two coats of white paint. I actually like it better with the frame around the mirror, it adds another layer of texture. I am so happy with this upgrade! I’ll come back tomorrow with the second half of the bathroom remodel.